The above is my latest successful purchase (from the wondrous Craftland), which now graces my refrigerator. 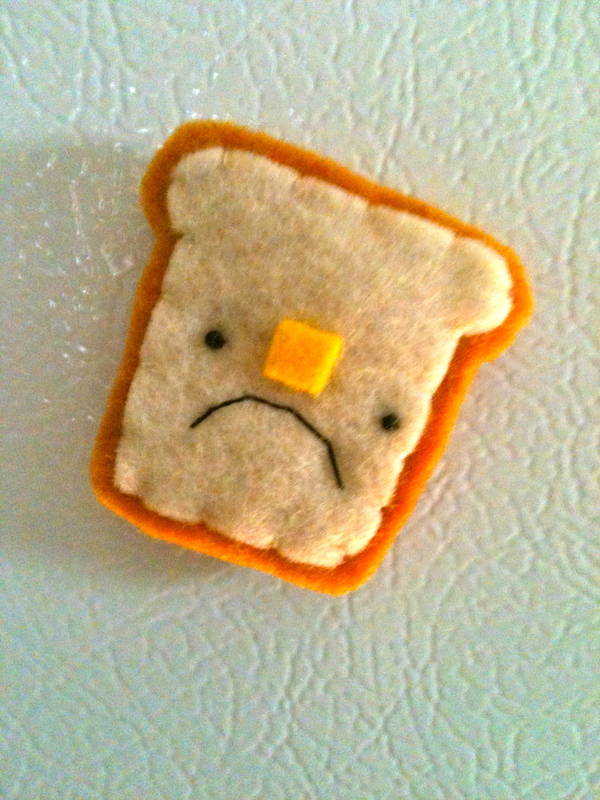 Is it wrong that this toast’s grumpiness fills me with so much happiness? In other happy news, I am working on not one, but TWO manuscripts this week, and am taking a break this Wednesday to do several Skype readings of my books for World Read Aloud Day. I’m already completely booked for March 7th, but I’m happy to schedule a free 20 minute visit with your school or library on any other day…drop me a line so we can work out the details! Look forward to two fun posts later this week: a reveal of my reorganized workspace, and a fun little decorating project I just finished. Why am I so passionate about making my house a home, you ask? When I was young, we lived in a house my parents bought and lightly remodeled in 1976. From that point forward, they refrained from making any style updates. This meant that the room I shared with my sister featured BRIGHT PURPLE SHAG CARPETING and BRIGHT GREEN PAINTED ACCENTS (closet doors, desk, built-in dresser drawers) the entire twenty-five years we lived there. It was not a space that reflected either my or my sister’s sensibilities, especially as we got older and developed more distinctive personalities and, you know, taste. But my mother was adamant that we couldn’t repaint or change the carpeting; I don’t remember exactly what her reasoning was, but I’m sure it had to do with the expense and the headache of it all. Thankfully, I now share a house AND similar taste with my husband, and we’re willing to endure the periodic expense (within reason) and headaches of home renovation. But we also get a lot of enjoyment out of it. We love being able to decide what paint colors we’ll use, where to showcase all the kitschy antiques and crafts I buy, what shelving (and lighting) Scott will use to display his model car collection, and yes, even what magnets we stick to our refrigerator. When we sit back and admire it all, we know it’s all truly ours. And I can rest easy that I’ll never come in close contact with shag carpeting again. allow that in our staid homes. I vowed to let our girls make their own decorating decisions, which became their own, within reason, and then it just became– which is why when D chose “Pepto Bismal pink” as a five year old, it’s still there, and she was 37 last week! J wanted clouds on her slanted, blue ceiling, ala “Kramer vs Kramer”,– they were painted- over two years ago, so we could adapt the still-blue room for our grandsons. convenient for storage– of memories as well as “stuff”. Wow, Eve! I didn’t know your connection to that house. Its wallpapered kitchen ceiling is still legendary among my friends (and my nightmares). Wow…I so do remember the wallpapered ceiling. I love seeing the pictures of what you’ve done with your home, it’s actually pretty inspiring.